Not long ago these qualities were written down by some of the greatest Belgian and French Champions. They are basically the following: balance, bone structure, muscular system, wing build, a rich plumage, suppleness and vitality. At this point experienced judges can help young fanciers and newcomers to make their own judgement. However, we should add that not all physical qualities can be seen from the outside, unfortunately. This makes the task of the judge a lot more complicated. The inner organs of the pigeon include heart, lungs, liver, diverse glands, intestines, digestive tract and breathing system. They all play an important role in the output of a pigeon and they can only be more or less judged by the outward signs that indicate whether or not a pigeon is in good health. This makes the task of a judge a lot more complicated and it shows that every examiner can make a mistake. Still, an examiner who is used to handling all kinds of pigeons will easily see the difference between pigeons that are in great health and pigeons that are not. Unfortunately, if an internal organ does not function as it should, it does not always influence the outlook of the pigeon. Even if this malfunction might affect the performance of a pigeon it is not always detectable. It sometimes happens that a person seems to be in perfect health, even though the heart does not function properly and the liver and the intestines are very sensitive. Such a person would never be able to compete in a competition, even though he is apparently in good health. This is a first point that contradicts many theories. We could conclude the following: even the most honest, skilful and strict examiner can never guarantee that a pigeon will breed nothing but great youngsters, even when the fancier strictly follows the advice of the examiner. An experienced fancier knows when to be careful and who to trust. He is well aware that, despite his wishes and his skills, life and nature do not improve as quickly as our civilisation. Some fanciers and scientists are not willing to agree that they make mistakes sometimes. Earlier on, we were talking about the fact that the internal organs of a pigeon are very difficult to examine. There is also a second aspect that is of great importance, and which sometimes baffles even the most skilful judges: the physical qualities of a pigeon. A pigeon can have the perfect characteristics to become a great racing pigeon but that does not make it a successful pigeon. That is because it sometimes lacks good orientation abilities, as a result of which this pigeon will not be of great value in your racing team. The various Dordin reports have proved that a pigeons does not always return home in a straight line. This means that the first pigeon to arrive home is not always the fastest pigeon. The will to win and great orientational abilities are two indispensable qualities of a good racing pigeon. However, these two qualities are impossible to estimate by the examiner. It is in fact the fancier who spends the most time among his pigeons and who breeds, studies and trains them and who knows their origins. He is the best judge in this situation. At this point his own observations and the results of the pigeon are the best ways to assess the quality of your birds. 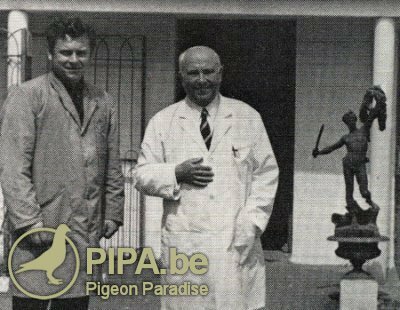 When the manager of our mourned friend Georges Wibail released 200 pigeons he always loved to bet that his Petit Champion would be the first pigeon back in the loft once the pigeons were let out. This illustrates how a fancier truly knows his pigeons; this can only be achieved through regular observations. Nowadays there are too many pigeons that do not last very long. The reason is basically because selection is based too much and sometimes exclusively on the physical features of a bird and the results in the basket, without taking notice of any other aspect. This occurs mostly in short distance lofts. If you want to be at the top you will have to focus on the intelligence, the will to win and the physical qualities of your birds simultaneously as much as possible. The things we just mentioned do not alter the fact that you have to select your birds strictly. The best way to do this is by taking them in the hand to be able to feel the value of the pigeon. As we said earlier it is nearly impossible for a pigeon to follow a straight line and to have the will to win in every race it is basketed for. However, when you notice that the bird’s strength declines after a few races you might want to eliminate that bird. Success depends on different factors that should be in harmony with each other: physical and mental qualities. A short distance flyer for instance should never focus too much on the qualities in the basket, because he does not have enough time to make a good judgement. On the other hand, a long distance fancier should not only focus on the outside characteristics without taking notice of the mental strength as well. 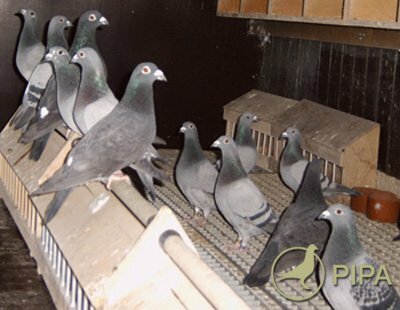 If you can focus on the different aspects of the pigeon regularly for several years in a loft with pigeons of good quality, you could eventually have a team that is nearly perfect. You will have pigeons that have the physical abilities and the intelligence needed to become successful. Moreover they will use their abilities in the hardest races for several years in a row. We have repeatedly said that a pigeon needs different qualities that should be in harmony with each other. You cannot categorise these qualities and focus on just one peculiar characteristic or feature of a pigeon. The best pigeon is undoubtedly the pigeon that combines different qualities that are needed to fly fast, in a straight line and for a long period of time. Nowadays, nobody will deny that pigeon racing has become an art. Young fanciers should be convinced of this and it would be great to see them become an artist in our sport in the shortest time possible. In every sport there are newcomers who obtain the required knowledge and who force their way to the top, leaving other, often more experienced fanciers behind them. However, you cannot obtain knowledge and skills without an effort. You can only become a specialised sportsman through individual effort. Success in pigeon racing is most of all a question of balance and the right medium. The right medium and balance are equally important in breeding, preparing and racing your birds. In our sport it is very difficult to reach the top and to stay at the top. Even when you race at the top level, even the smallest mistake can cause you to fall back. We could give you more than one example of all the things we have discussed here. The right course and balance are vital; you should never exaggerate. Is it really necessary to give more examples? Most fanciers who have or have had an outstanding pigeon are very demanding on their other birds as well and they want them to have the same characteristics as their best pigeon. This influences their selection as well. However, not all good and bad pigeons are similarly shaped. In fact, no two pigeons are the same. If this were not the case, our sport would lose a lot of its attraction. The many theorists in our sport in the last century all claimed to have made a sensational discovery but each of these discoveries failed the test. Some wish that a good pigeon has a certain shape, a certain eye type and wing size. However, an examination of twenty outstanding pigeons proved that there was at least one feature that was completely different in each of the birds. When you take a look at some other sports you will notice that no two athletes have exactly the same shape either. Do you think you can tell by the size or the form of the legs of Zatopek, Coppi or Reit that they would become great champions? Is a boxer of 110 kg by definition stronger than a boxer of 81 kg with similar musculature? Rik Van Steenbergen and Stan Ockers, two world class cyclists, were both in a six day pursuit race in the United States, in one of the best teams in the world. The two worked very well together in that race and yet, they were two completely different types of riders. Bruyneel was an outstanding athlete but when he was not fit everybody could beat him. Harmony, development, a synchronous functioning of all organs, both the inside and outside organs, that is what makes a balanced racing pigeon, which is able to give great performances. However, you should remember that if one of the organs does not function properly, your athlete will not be able to fly as it should. If we would dismantle a timepiece we would find small parts that seem useless. However, if just one of these parts were missing the balance would be lost and the mechanism would no longer function. We conclude with the following advice: be careful, do not make any rash decisions, always be on your guard for exaggerations and refrain from exclusiveness. This does not mean we can lean back and leave the rest of the work to our pigeons. In fact we should continuously observe our pigeons and experiment with them. That is what makes our sport so attractive. We always have to look for something better. This is what gives joy and satisfaction to those who are truly passionate about our sport. We fully appreciate the efforts of the pioneers in our sport. There is so much room for research. Their sole objective is to improve our sport and to discover something new. Neither they nor we should forget that the most important thing has always been the results and the progress we achieve. To our many readers we will say this: remember that progress will only become real when we manage to improve the qualities of our pigeons. Take notice of every small aspect that keeps this wonderful creature together and the elements that turn it into a successful bird. If you have done so, we sincerely hope that everything works out for you. we use from one particular method called forced moulting . it have lots of benefits for race team.